Makeup Remastered- reinvent yourself daily: My Favourite cleansers-Highly recommended ! Cleansing forms the basis for any good skincare routine. I have always had any oily skin, so from the start always opted for a cleanser that in my mind made my skin feel squeaky clean. As skincare has evolved over the years, so must our mindset of how we choose what to use. Traditionally, someone with an oily skin would lean towards foaming cleanser and those with dryer skins milky solutions that were usually tissued off. Many skincare brands now market their products with two strategies in mind. Firstly, what the product can do for your skin- radiance, anti-aging, whitening etc. Secondly the finish of the product ie gel, creamy or oil. So years later my skin is still oily and prone to blemishes and dehydration. 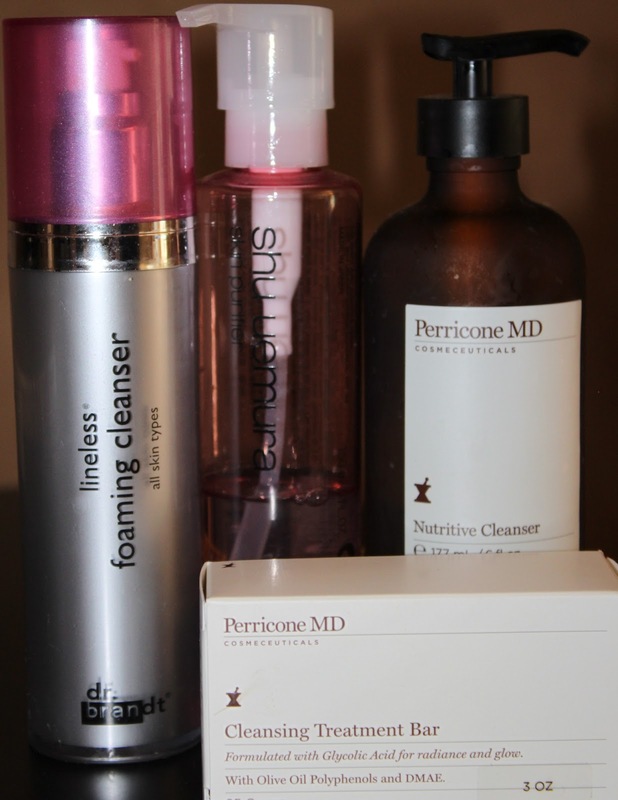 I now not only look at how the cleanser makes my skin feel, but also what my skins main concern is for the moment. I have four favourite cleanser that are in rotation at the moment. This is a wonderful cleanser that is anti-aging. It is packed with Dr Perricone's signature ingredient's which includes DMAE and Alpha Lipoic Acid. It is a gel that I use with or without my Clarisonic. It feels like it cleans my skin without stripping it of any natural oils. It helps with reducing pore size and improves the look of my fine lines (hopefully prevents them too.) Either way I'm loving it and have used it for quite some time now. I think it would work across the board with regard to skin type and age. Shu Uemura has a few varieties in their cleansing oil arsenal. This is their lightest oil and meant for people with normal, combination or oily skins. I think the basic concept with the oils is that oil attract oil (this is made possible by there "high performance oil system"). So, when you apply the oil to a dry skin it pulls the sebum away from your skin and dissolves impurities (this is my muddled understanding of it and I'm sure it is far more technical). As you add water and slowly emulsify, the product goes milky and rinses off. My skin is left soft and refreshed. I typically use this in the morning., but is also good for eye make removal when cleansing the whole face. This particular one is for pore refining and the SA described this one as the express formula within the cleansing range. Ingredients such as avocado and jojoba protect the integrity of your skin's moisture levels. If you have oily skin, do not be afraid of dousing your skin in this oil - this really works! Okay, so one of the main reasons I love this cleanser, is that as you apply it in it's gel form. Suddenly it expands and puffs up into a luscious foam that sweeps impurities away. I am a sucker for these little pleasures! It has ingredients like apple fruits, sunflower seed and tangerine leaf oil to help act against free radical damage and hydrate while cleansing well. This is meant for use on all skin types and part of their Lineless Range for first steps to preventing and correcting the first signs of wrinkles. I have also repurchased this product and will continue to use it. Who does not love a bar of soap. Well this is the best, and then some! This gentle yet thorough cleanser has glycolic acid in it which helps clear impurities and keeps pores super clean. My skin is hydrated as it also contains Olive Oil Polyphenols. Lastly this little beauty has DMEA which works to tone my skin. So it's anti-aging while it gently exfoliates too! As a bar this is great for on- the- go use- as there is no leaking in your bag. This also can be kept in your shower for express use - lovely! I purchased all these products myself. I would love to here which are your favourite cleansers.